Pitchers, panelists and ADM board members after our 2018 Annual Funding Event. 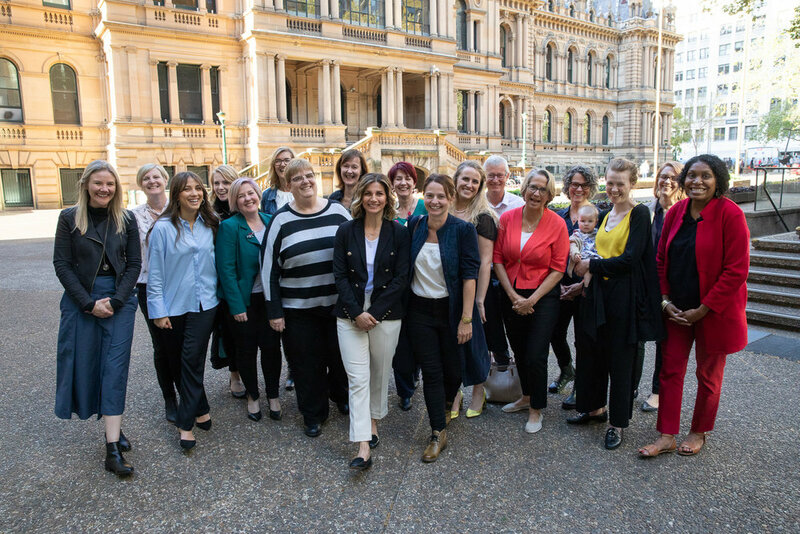 Anglican Deaconess Ministries has awarded over $60,000 to Australian Christian women from across the globe in its third Annual Funding Event on Wednesday, 19 September. Selected women representing four states across Australia as well as Norway, Papua New Guinea and the UK received funding for a variety of unique Christian initiatives and ministries. Aligning with ADM’s 127-year old commitment to theological formation, mercy and justice and public engagement, this year’s 17 applicants presented projects within the categories of IDEAS, FORM, DO and ENGAGE. Applicants offered five-minute pitches in front of expert panellists and an audience of over 80 guests including church ministers, business women, lay leaders and artists. Overall winner, Jen Logan of Fer, was presented with her award by Rev. Jenni Stoddart, ADM’s board chair, via a video call as [from left to right] Sono Leone, Anna Weir, Bernadette Black and Dr Kate Harrison Brennan look on. After the pitches were considered, Dr. Kate Harrison-Brennan, CEO of ADM, and Rev. Jenni Stoddart, ADM’s board chair, presented the winners in each category. Capturing the overall award of $25,000 of the day, and winner of the ENGAGE category, was Jen Logan, Director of Fer, an international visual arts initiative based in the U.K.
Bernadette Black, CEO & Founding Director of the Brave Foundation, an effort that assists teen parents, won $12,500 in the DO category. Anna Weir, Founder & Leader of The Fireplace, a Christ-centred gathering for professional and emerging artists in the entertainment industries, won $12,500 in the category of FORM. The People’s Choice award of $2,000 went to Sono Leone, Founder and Director of Strong Women Talking, a ministry that addresses domestic violence within Indigenous communities. All of the other women who pitched during the day also received $1,000. In addition to cash prizes, the three category winners will become part of the 2019 cohort of The Hub at ADM. The Hub is a unique, year-long mentoring program designed to enable entrepreneurial Christian women to take their initiatives to the next level.